You can insert a basic hyperlink in any Office document on a mobile device. In Word, you can also enter display text for any URL you insert. PowerPoint also lets you enter display text for any URL you insert. Insiders are Office 365 subscribers who get an early look at the new features each month and help the Office team evaluate them. Become an Insider. You can add a basic hyperlink in an Office document on a mobile device by simply typing a valid URL followed by a carriage return. For example, type www.wikipedia.com or http://wikipedia.com, and then tap the Return button. 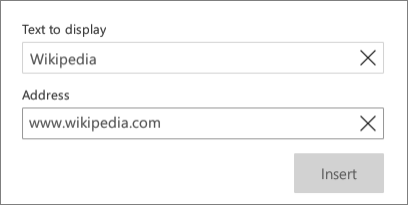 Office recognizes the text as a URL and inserts a hyperlink. On your Android tablet, tap the Insert tab. On your Android phone, tap the Edit icon at the top of your screen, tap Home, and then tap Insert. Enter the text to display and the address of your link. On your iPhone, tap Edit at the top of your screen, and then tap Home. Enter the address of your link and the text to display. On your iPhone, tap Done. On your iPad, simply tap outside the dialog to dismiss it. On your Windows tablet, tap the Insert tab. On your Windows phone, tap More at the bottom right of your screen, tap Home, and then tap Insert.